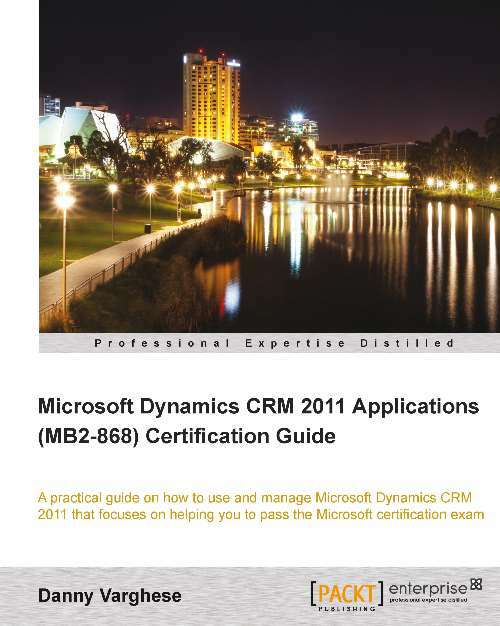 Packt Publishing asked me to do a review of Microsoft Dynamics CRM 2011 Applications (MB2-868) Certification Guide. 1. I couldn’t find any obvious technical errors in it when I read through it. So that makes it a reliable reference and training manual. 2. It has a nice ‘conversational’ tone to it. While it is mostly step by step point and click (which it should be), it does interject some additional insight into the processes that you might get if you were in a class room environment. 3. It is very thorough. It appears to cover the breadth and depth of the knowledge you will need to get positioned to sit for MB2-868 exam. Although, don’t expect that reading through this book or for that matter any similar Microsoft exam material training publication to get you 100% ready by itself. I would recommend that you read through the book cover to cover and then go back and actually step through each activity with a real CRM system. 4. The book includes 75 sample test questions, plus quiz questions at the end of each chapter. But one thing this book does that most don’t is in the answer key it expands on just identifying what the correct answer was by giving more information on what makes the wrong answers wrong and the right answers right. Overall, it is a worthwhile purchase to make as you pursue the CRM 2011 Applications Exam – MB2-868.